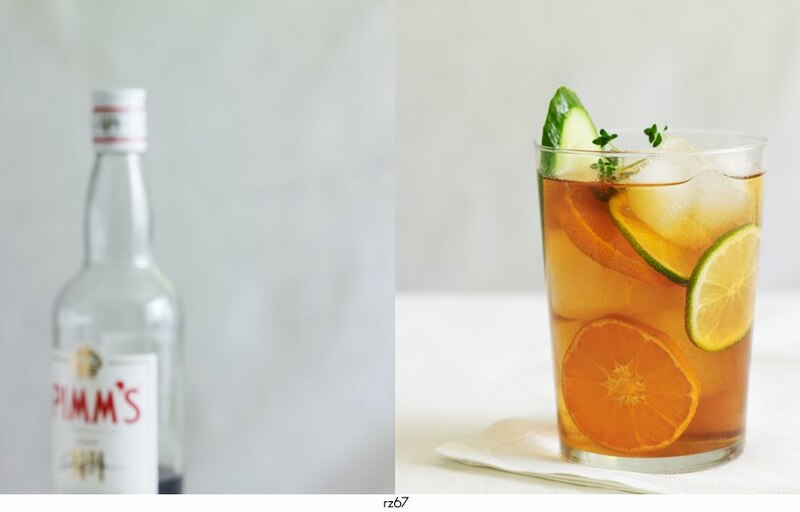 here's a quick cocktail to get your holiday weekend started off just right! pimm's no. 1 cup is a gin based liqueur and the drink of choice if you're headed to any polo matches this summer. we love the pimm's cup so much it was one of the signature drinks at our wedding! there are several different versions - some with lemonade, some with sliced apple, some with mint or basil, and they're all equally delicious but this is our favorite right now. have a wonderful & safe memorial day weekend! fill a highball glass with ice. add 2oz pimm's no. 1. top with ginger ale and stir. garnish with 2 slices of lime, 2 slices of tangerine, a slice of english cucumber and a small sprig of lemon thyme. enjoy! So refreshing! With all that fruit, I may forget there's alcohol in it and get myself in a wee bit o' trouble. Not my type of drink but gorgeous photos and fantatsic way to kick off the weekend! such great photos -- you need a different blog design so you can make these photos a lot larger! Mm, reminds me of NOLA. Such a refreshing drink. I like to add a splash of lemonade to mine as well. Sippin' in a little bit of California in New York, eh?? I might just have to make one today too, it's been along time since I've had a Pimms Cup...mmmm !! I've always wanted to try Pimms, and this looks like a great place to start! Perfect for a hot summer night. This is one of my favorite cocktails! Thanks for posting your recipe. So happy to have found your blog. It is truly stunning. i became a huge fan of pimm's while living in the uk a few years back. my favorite way to have it is with sparkling lemondae, strawberries and green grapes. delish and so refreshing! I love Pimm's I serve mine with frozen strawberries and lemon slices and a splash of sparkling water! I screams summer! Never tried Pimms but now I will! Thanks! Summer Pimms will always remind me of London adventures. Cheers! I'm a big, big fan of Pimm's with ginger ale.